Several years ago, an Atlanta mother wrote an article for CNN describing her then-four-year-old son Teddy’s food allergies. In the article, she explained how painstakingly vigilant she had to be in order to protect Teddy — who is allergic to milk, eggs, wheat, peanuts and tree nuts — from kid-friendly foods like chicken nuggets, pizza and sandwiches. Even things like macaroni necklaces and Play-Doh are a threat to him. She has to keep a special supply of Teddy-safe snacks both at home and at his school, where she maintains constant communication with the staff about strategies to keep Teddy safe. Teddy’s case may be extreme, but it is not unique — nearly 15 million Americans are affected by food allergies. An allergic reaction to food occurs when the body’s immune system mistakenly attacks a food or ingredient. Food allergies can occur at any age, but are most prevalent in babies and children. The Centers for Disease Control and Prevention recently reported that 4 to 6 percent of children in the United States are affected by food allergies, a 50 percent increase from the late 1990s. Nearly two children in every classroom have a food allergy, according to the Food Allergy Research & Education (FARE) group. Some of Dr. Baxter’s patients are confident of the food(s) that cause an allergic reaction; for example, they break out into hives or their face swells immediately after eating shellfish. Other patients are unsure of the exact food causing allergy-like symptoms. The American College of Allergy, Asthma & Immunology notes certain allergies (e.g., milk, eggs and soy) may disappear over time, while others (e.g., nuts and fish) are more likely to last a lifetime. 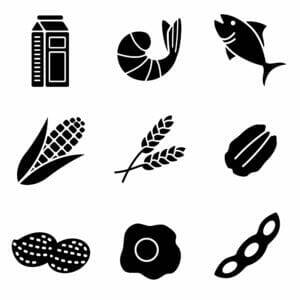 Food allergy symptoms may be mild (e.g., itchy mouth) or potentially deadly (e.g., anaphylaxis). FARE has reported that food allergy reactions are responsible for more than 200,000 emergency department visits every year. Food allergy symptoms include itching, sneezing, runny nose, abdominal cramping, nausea, vomiting, diarrhea, rash, eczema, hives and swelling of the lips/mouth (also referred to as oral allergy syndrome when it occurs as the only symptom). Another food allergy event is feeling like food is stuck in the esophagus during swallowing, which could be indicative of a condition called eosinophilic esophagitis. It is important that those suffering from allergy symptoms avoid self-diagnosis. Many patients who self-diagnose end up restricting their diets unnecessarily, which can lead to nutritional deficiencies or cause them to overlook other possible food disorders they may be suffering from. Food allergies should be diagnosed by an experienced allergist like Dr. Baxter, who has years of clinical experience and uses state-of-the-art diagnostic tools. What symptoms do you experience after eating the food? How long after eating the food do the symptoms occur? How much of the food do you typically consume? How often have you experienced the allergic reaction? Have you had any medical treatment for this? Does your family have a history of food allergies? After discussing food allergy symptoms and possible triggers in greater detail, Dr. Baxter will order proven diagnostic testing to confirm the food allergy. The Prick Test: A standard method for allergy skin testing, prick skin tests are quick, convenient and easy to use. A small amount of the suspected allergen is placed on top of the skin surface, and skin under the fluid is pricked in the center; if a raised bump develops, this signals an allergic reaction. All the desired tests can be administered in just a minute or two, with results ready in 10-15 minutes. You will receive a photograph of your skin reactions when the results are complete. ImmunoCAP Blood Test: The ImmunoCAP blood test identifies specific allergen sensitivities by measuring the amount of allergy-type antibodies (immunoglobulin E or IgE) in the bloodstream. Highly accurate and reliable, the ImmunoCAP can be used alone or in combination with another test, and can sometimes pick up a reaction that fails to cause a skin-test positive. It can also be used for patients who are unable to successfully wean off their antihistamines in order to have a skin test. Patch Test: Unlike the Multi-Test and ImmunoCAP blood tests, which evaluate immediate allergic reactions, the patch test evaluates delayed allergic reactions. The patch test involves placing a food patch test panel containing small amounts of the suspected food allergens on the patient’s back. Dr. Baxter removes the patches after 48 hours and evaluates the patient for any reaction; she usually also evaluates the patient after 96 hours. Unlike reactions to prick skin tests, patch test positives usually persist for several days. Elimination and Challenge Method: Either before or after skin or blood testing, an important way Dr. Baxter tests for food allergies is by asking the patient to eliminate the suspected food for one to two weeks, and then consume the food (if the reaction was not dangerous) to see if the suspected symptoms clear up and then return. If symptoms decrease or disappear during the elimination period of time, it’s very likely the food is causing an allergy. Dr. Baxter combines the information gleaned from the patient’s medical history, along with the test results, to make an educated diagnosis. Then, she works with the patient to see if the response to treatment shows the diagnosis is correct. There are no cures for food allergies; however, there are ways to manage life with a food allergy, get the proper nutrition and avoid allergic reactions. In cases where a specific food has caused a life-threatening reaction, the patient must diligently avoid the suspected allergen. This requires checking the ingredient labels of food products, learning other names for the foods that cause symptoms, and carrying an EpiPen in case of accidental exposure and a systemic reaction. If history suggests that a food has caused mild symptoms, it may be helpful to pre-medicate with Benadryl or a less sedating antihistamine before eating a meal that contains the allergen. Oral immunotherapy (OIT) is an up-and-coming treatment option which desensitizes the body to allergens. OIT patients start by consuming the largest serving of the triggering food that they can tolerate (sometimes as small as a tiny fraction of one drop of milk), and gradually increasing the serving until they’ve reached a meal-sized portion — for example, a glass of milk or a whole egg. It usually takes between three months and a year for patients to reach the right maintenance dose. At this point, the patient must eat the food every day so the body can maintain its tolerance. OIT is not yet currently approved for general use. If you are experiencing symptoms that you believe are related to a food allergy, Dr. Barbara Baxter is here to help. Dr. Baxter is board-certified in allergy-immunology and has been providing patients with accurate food allergy diagnoses for over 30 years. To learn more, schedule a consultation today at our food allergy testing center in Dallas.